NOBLESVILLE, Ind. – Wildkat Nation is in mourning. In one of the most shocking announcements in the 111-year history of Kokomo High School boys basketball, popular Wildkat head coach Brian McCauley announced he will step down from his alma mater to take over the Noblesville Miller program. The 36 year-old McCauley leaves behind one of the most historic – and stable – basketball programs in Indiana for a team shrouded in controversy. After four consecutive sectional championships and eight seasons on the Red and Blue bench – seven on which included 13 wins or more, including the memorable Class 4A state runner-up team in 2011 – McCauley takes over a Noblesville program that has won one sectional title since 1998 (2010). He inherits a team that is in turmoil after longtime head coach Dave McCollough was not retained; during last season, he served a two-game suspension for allegedly striking a Millers player with a basketball during practice. At the board meeting in which McCauley was hired by a unanimous vote of the school board, patrons of Noblesville spoke for more than 35 minutes in support of McCollough. More than 100 supporters were in attendance and loudly cheered each speaker who wanted the board to postpone the vote for a new coach and investigate the accusations against McCollough. Those pleas fell on deaf ears. McCollough spent 20 seasons at Noblesville and leaves as its all-time winningest coach (308-138). He won sectional titles in 1996, 1997 and 2010 and a regional championship in 1997. His 308 wins are 11th most among active coaches in the state and in 18 of his 20 seasons his Millers finished above .500. In 31 years as an Indiana boys basketball coach, he amassed a record of 465-223. McCauley leaves Kokomo with a record of 130-58. He is tied with Alfred Campbell as the fourth winningest coach in Wildkat history – trailing only Indiana Basketball Hall of Fame inductees Joe Platt (260), Carl McNulty (256) and Basil Mawbey (248). He won five sectional titles (2009, 2011-2014), adding to Kokomo’s IHSAA record 74 sectional championships. He also led Kokomo to three North Central Conference titles (2010, 2011 and 2013). McCauley coached a pair of Indiana All-Stars and NCAA Division I players in D.J. Balentine (2011, University of Evansville) and Tayler Persons (2014, Northern Kentucky University). McCauley vaulted Kokomo back onto the state scene after the one-year reign of Rick Baumgartner in which the Kats won just 10 games. McCauley lost his first nine games at Kokomo, but since then he has won more than 72-percent of his games. The young coach had three consecutive 20-win seasons from 2011-2013, and would have had a fourth if not for the untimely injury to Persons at the start of the season. The new Noblesville coach is a 1996 graduate of Kokomo, where he was a three-year varsity performer for Mawbey. As a player, his Kats were sectional champions three times and regional and NCC champs twice. As a senior, he averaged 14.3 points per game and his squad won its first 19 games to claim the No. 1 ranking in the state. In college, McCauley was an NAIA Academic All-American while playing for Olivet Nazarene University. In his senior season, the Tigers reached the NAIA Final Four while he averaged 8.7 points per game. McCauley is married to Amy and they have two children. 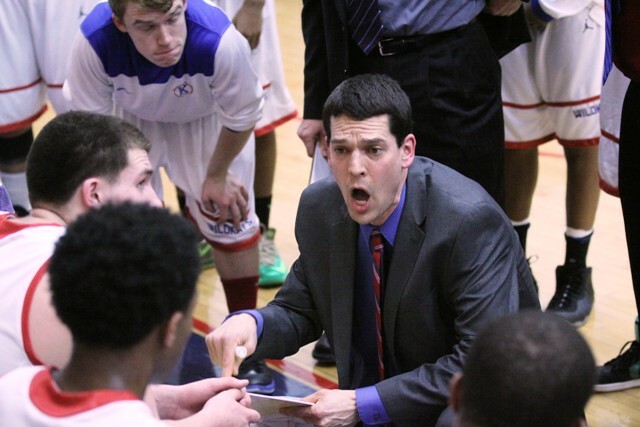 Kokomo will begin the search for the school’s 24th Wildkat boys basketball coach immediately. This entry was posted in Kokomo, Wildkats. Bookmark the permalink.